Papagena is an a cappella group consisting of three sopranos and two altos. I believe they’ve released a previous album, entitled Nuns and Roses, though I’ve not heard it; indeed, the group was completely new to me when I received this disc. The programme they offer here is a discerningly chosen and wide-ranging one containing music that covers a span of at least eight centuries and a great variety of styles. Here, medieval pieces nestle with arrangements of Ravel and Joni Mitchell and do so comfortably. As annotator Michael Quinn puts it, the season of winter “exerts a harsh glamour all its own at a time of year fraught with pagan and Christian significance, the season’s signature surrender to natural forces acquiring supernatural associations in both traditions.” You’ll find a stimulating variety of seasonal reflections in this programme. I think it’s quite likely that if you put this CD into your player and listen to the first track you will be, as I was, instantly hooked by the bewitching sound of Papagena. Don oíche úd i mBeithil (I sing of a night in Bethlehem) is a traditional Irish song. The melody is haunting and the arrangement by Suzzie Vango is as beautiful as is the sound that she and her colleagues make. Maria durch ein Dornwald ging is a very lovely German tune, here luminously arranged by Philip Lawson. The fourth and sixth verses of this piece allow us to appreciate the lovely warmth of this ensemble’s alto voices – happily, not for the last time during this programme. O Jesulein zart is another traditional German tune; the chorale, harmonised by Bach, will be familiar to many from the carol O little one sweet. Here, it’s given a surprising treatment by Winnie Brückner. A solo voice sings the well-known tune while the other voices decorate the melody with discreet syncopated, almost jazzy lines. I think it’s very effective and I loved it. So far, the individual numbers I’ve mentioned have been mainly gentle and reflective but Papagena are equally adept when it comes to livelier settings. The medieval English carol Nowell, tidings true there be come new is a jolly affair and here the irregular rhythms are emphasised by the addition of a drum. The drum makes another appearance much later in the programme, insistently underpinning sections of Det lisle bånet (The Little Child). This is a modern treatment by Tone Krohn of a traditional Norwegian song. It’s a very imaginative arrangement. If you like upbeat seasonal music then Shchedryk (Hark How the Bells) will make you smile while Papagena’s spirited performance of it will get your toes tapping. It’s a Ukrainian song, here most skilfully arranged and adapted. Given the English title it’s appropriate that the singing should be bell-like in its clarity and rhythmic precision. This terrific performance is irresistibly joyful. Among other pieces that caught my ear, the arrangement of Gaudete is a skillful one – a world away from Steeleye Span! Equally effective is the arrangement of In dulci Jubilo; it’s just that bit different and enables the tune to dance along nicely. 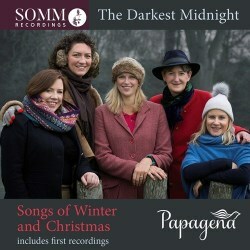 This offers another opportunity to admire the expert blend of Papagena’s voices. No blend is on offer in The Darkest Midnight, however. This is another Irish melody and here it’s sung by a lone, and very poised, soprano - it would have been nice if the pure-toned singer had been credited. Many of the selected pieces have their roots in olden times but there are some modern pieces too, including A Nativity, Sir John Tavener’s setting of W B Yeats’ poem. The words constitute a most unusual commentary on the Nativity scene and Tavener sets the poem to typically spare, effective music. The Waiting Sky was written expressly for Papagena by Oliver Tarney. He sets Lucia Quinault’s poem using wonderful harmonies and the piece is beautifully served by the exquisite blend of the five voices. Jim Clements’ arrangement of Joni Mitchell’s plaintive song, The River seems very effective – I say “seems” simply because I don’t know the original. This number shows a different side of Papagena and they put it across very well. The programme closes with two pieces by the American, Don MacDonald. When the Earth Stands Still is a touching piece which is expressively sung. I’m afraid, though, that I’m not so keen on Fusion. Here MacDonald sets no actual words; instead the piece is based on syllables and rhythmic patterns. It’s not really to my taste. However, this album as a whole is very much to my taste. I found the programme stimulating, varied and full of interest. But what sets the disc apart is the superb singing of Papagena. This really is an outstanding ensemble. Technically, the singing is flawless yet there’s no mere studied perfection here; the five singers really communicate the pieces they’re singing and they do so in a fresh and very engaging fashion. The singers have been most sympathetically recorded by engineer Will Biggs, working with producer Adrian Peacock. The documentation is up to SOMM’s usual high standards. This is a disc to cheer your spirits in the depth of winter.